John Wayne “Punkin” Brown Jr. was a preacher for a Pentecostal-type church. He’s now dead. He still would be alive but for the fact that he believed false doctrine. Before his ascension back into heaven, Jesus commissioned his apostles to preach the gospel to the whole creation. In connection therewith, the Lord promised he would confirm the validity of their message by giving them the ability to perform different kinds of miracles. “[Th]ey shall take up serpents” (Mark 16:18). “I have given you authority to tread upon serpents and scorpions” (Luke 10:19). A striking example of how this promise was fulfilled is found in an incident during the ministry of Paul. When the apostle was traveling to Rome as a prisoner for Christ (Acts 27:1ff), his ship was wrecked upon the island of Malta. The inmates of the vessel huddled together on that cold morning and built a fire on the beach. The ever-industrious Paul had gathered a bundle of sticks. When he started to put them on the flames, a poisonous viper slithered out and fastened on the apostle’s hand. The observers thought Paul soon would be dead. Amazingly, he suffered no harm at all. His hand did not even swell (Acts 28:5-6) — as confirmed by Luke, the physician (Col. 4:14). This sign demonstrated that the gospel Paul preached was indeed true. What many do not understand is this. Those miraculous signs were confined to the first century. They were temporary gifts, given as the New Testament documents were being prepared over a span of about fifty years. Our Pentecostal friends believe that those miracle-working abilities continue even to this day. And some of them, particularly in the region of the southern Appalachian mountains, practice snake handling in their religious services. The movement had its origin in about 1910, and has been the subject of numerous studies and television specials. “Punkin” Brown was one of the leading practitioners of this movement. But not any more. He is dead at the age of thirty-four. 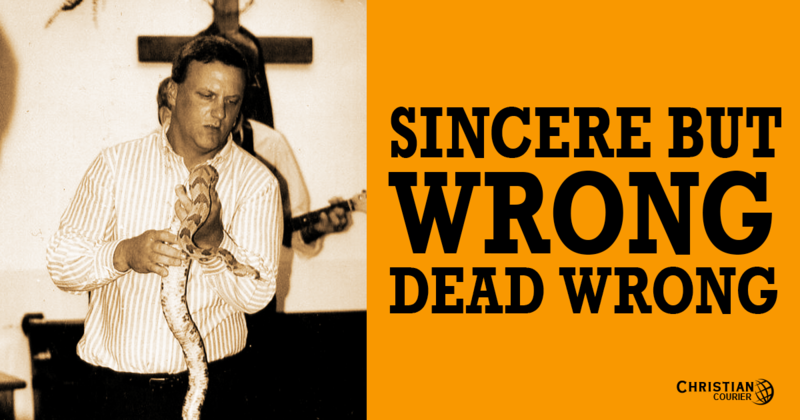 Brown, the father of five children, was handling a three-foot timber rattler during one of his services on Saturday, October 3, 1998. The snake bit him on the finger, and within ten minutes he was dead. This tragedy is compounded by the fact that Brown was a widower. His wife, Melinda, died three years earlier when she was bitten by a rattler in the Full Gospel Tabernacle in Jesus Name Church in Middlesboro, Kentucky. Now, five children have neither a mom nor dad—simply because their parents, who obviously were quite sincere, believed the false doctrine that miracles (e.g., taking up serpents) still prevail today. Compassionate hearts grieve for this family. In spite of that, a teacher of truth has the obligation to highlight the utter fanaticism characteristic of these people. Why can’t folks see the error in this deadly practice? According to newspaper accounts, one fang of the snake pierced Brown’s finger. Within moments he toppled over. Why was he so affected? Because he did not have the “take-up-serpents” sign. Interestingly, one of the first reactions of someone in the congregation was to call 911. Why did they not just pray for him, and heal the gentleman? Healing is listed in the same passage that mentions taking up serpents. The answer is all too obvious. They did not have that power either. Moreover, once Mr. Brown expired, why did not someone in the congregation raise him from the dead? Raising the dead was also a first-century sign (see Mt. 10:8; Acts 9:36-42; 20:9-10). They could not raise the victim from the dead! As sad as this episode is, it illustrates how utterly deceived a person can be. Example after example of fatalities in connection with these snake-handling services can be cited, yet these poor people continue to practice this bizarre religion. Some folks, under the sway of religious dogma, appear to lose the basic ability to reason correctly. Too, this case graphically illustrates the fact that sincerity in religion doesn’t count for anything unless it is coupled with truth. Mr. and Mrs. Brown were obviously sincere, but they were wrong. Now they are dead—dead wrong! Every person needs to examine his religious beliefs in order to determine whether or not they conform to the New Testament. Just as sincerity does not negate natural law, neither does it cancel spiritual law. Sincerity is to be applauded as a personal trait; but if it is coupled with error, it can be deadly. The Des Moines Register. 10/7/98.